Serious fisherman demand serious equipment and those needs are met with the Stessco Fisherman range. The spacious layout includes casting platforms (front and rear) with ample storage, deluxe upholstered seats and premium paint and graphics. Everyone in the family will find something to like about this range. 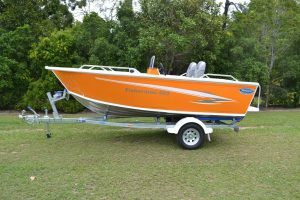 The Stessco Renegade range represents a boat packed with plenty of premium features. 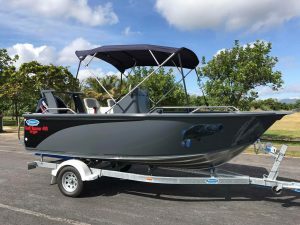 With a sleek look and performance this serious fishing vessel comes standard with the following features: plumbed live bait tanks, plumbed kill/keeper tank and the added luxury of a side console and deluxe pedestal seats. Experience your greatest passion to the max. Solidly built to handle any situation, seasoned anglers will appreciate the intelligently designed storage compartments that make it quick and easy to find what you are looking for. It’s your turn to enjoy the solid strength of a Stessco Gulf Runner. Are you the type of person for which a fishing day starts at dawn and finishes at dusk? If so this boat series is perfect for you. 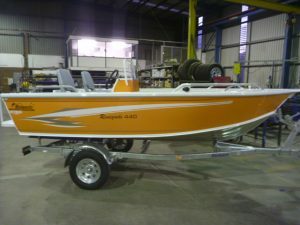 With engine HP ranging from 90 to 150, lots of storages, lots of standard fishing features and great options this boat can have you dominating the waterways in no time.